Pharmaceutical laboratories operate under strict regulatory environments and provide vital services to their customers who expect accurate and reliable results produced within stipulated times and at reasonable cost. Adoption of the quality management system (QMS) by a laboratory in compliance with the ISO 17025 standard is the best way to achieve, maintain and improve accuracy, timeliness and reliability of the test results. The present article summarizes the QMS principles, steps for the QMS implementation and the practical benefits of accreditation according to ISO 17025. Focus is given to key aspects such as quality documentation, document control, control of records, internal audit, corrective and preventive action, management review and continual improvement. The strategies described herein may be adopted as a guide to implement the QMS in a pharmaceutical testing laboratory for assuring the quality of their results and services. Pharmaceutical laboratories carry out tests and assays for the confirmation of active pharmaceutical ingredients, pharmaceutical products and excipients to meet predefined specifications and thus play an important role in clinical or public health setting. Pharmaceutical regulation is heavily dependent on the analytical results generated by pharmaceutical testing laboratories to describe accurately about the quality of each drug. For these reasons, the results produced by pharmaceutical laboratories must be as accurate as possible, all aspects of the laboratory operations must be reliable and reporting must be timely in order to be useful. Implementation of the QMS by testing laboratories is considered as the best approach to achieve these goals and attain accreditation status for their services leading to the validity of the test results. ISO has developed an standard, known as ISO 17025: 2005 ‘General requirements for the competence of testing and calibration laboratories’, for the accreditation of testing laboratories to a wide range of testing environments . Compliance with ISO 17025 standard requires that the laboratory shall establish and maintain a systematic way to ensure and improve its performance. Implementing an ISO 17025 based laboratory management system is a means to ensuring efficiency and technical competency in testing laboratories. In this article we summarize the recommendations and strategies for implementation of the QMS in pharmaceutical testing laboratories. The laboratory is a complex system, involving many steps of activities and many people. The key workflow steps in a pharmaceutical laboratory include sampling, sample handling, testing, reporting and record maintenance and are shown in (Figure 1). There are many procedures and processes that are performed in the laboratory and each of these must be carried out correctly in order to assure accuracy and reliability of test results. Therefore, the QMS model, which looks at the entire system, is very important for achieving good laboratory performance. The QMS is defined as a ‘management system to direct and control an organization with regard to quality’ [2,3]. The QMS consists of documentation of the laboratory policy and objectives, system procedures and instructions for assuring the quality of its results to meet safety and regulatory requirements and to satisfy the needs of the customers. A pharmaceutical laboratory which is developing framework for the QMS must establish, document, implement and maintain a QMS appropriate to the scope of its activities, including the type, range and volume of testing, as well as maintain its effectiveness in accordance with ISO 17025. All essential elements of the QMS are covered by ISO 17025 in two distinct sections: management requirements and technical requirements. Management requirements are related to the operation and effectiveness of the QMS within the laboratory. Technical requirements address the competence of personnel, equipment, testing procedure and reporting of test results. An effective QMS may be established by understanding the dynamic relationships of management and technical requirements. 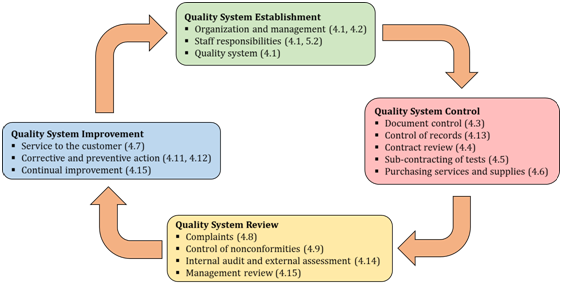 A structured approach to the establishment, control, review and improvement of the QMS is presented in (Figure 2). Figure 1: Workflow steps in a pharmaceutical testing laboratory. Figure 2: Approaches for establishment, review and improvement of the QMS. The numbers mentioned in the bracket refer to the main clauses of ISO 17025: 2005. A pharmaceutical laboratory or the organization of which it is a part must be an entity that is legally identifiable. For there to be an effective QMS, organizational structure capable of supporting the elements of the quality policy and quality objectives, as well as responsibilities and tasks of both management and technical staff should be defined. The organizational structure should be such that departments having conflicting interests do not adversely influence the laboratory’s work quality. Also, the organization should take into account applicable regulatory requirements, the size of the laboratory, the complexity of materials and products, and other critical activities when developing the QMS structure. The QMS should be designed to maintain its robustness, even when changes occur. Also the roles and responsibilities of the laboratory staff, including quality manager and technical manager, should be defined and conflict of interest should be identified. A quality manager has the defined responsibilities for effective implementation of the QMS on a day-to-day basis for administering the document control system, for compiling the quality manual, and for organizing the reviews and audit of the quality system. The quality manager must have direct access to the highest level of management at which decisions are taken on laboratory policies or resources. On the contrary, a technical manager is responsible for all the technical practices of the organization. The organization should establish job descriptions, with clearly defined responsibilities and authorities. Establishment of the QMS is primarily driven by proper documentation of laboratory policies, processes and procedures. Documentation is the mechanism for defining the quality system so that there is a consistent and secure basis for monitoring the system. Documentation used in the quality system must be communicated and available to, understood and implemented by, all laboratory personnel. 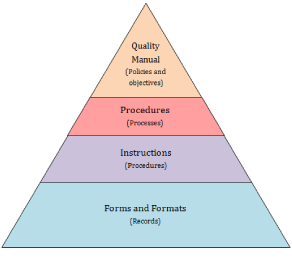 The hierarchy of essential documentation for establishing the QMS is illustrated in a pyramidal form in (Figure 3). The key piece of quality documentation is quality manual which constitute the apex of pyramid. Quality manual describes the road map to the whole documentation of the laboratory and contains the quality policy, organization structure of the laboratory, responsibilities of laboratory staff for management of the QMS and technical operations, QMS procedures, and management responsibilities. The quality policy of the pharmaceutical laboratory shall describe the laboratory management’s intentions with respect to the purpose of the quality system and quality of testing, commitment to continual improvement in the performance of laboratory, statement that laboratory work will withstand scientific and legal requirements and statement on the commitment by the laboratory staff in ensuring compliance with ISO 17025. All personnel of the laboratory are responsible for adherence to the quality policy. The quality policy may be subject to periodic review but is unlikely to change significantly unless the primary purpose of the laboratory is to change. Figure 3: Hierarchy of quality documentation. Quality manual also describes the procedures, commonly known as SOPs, for effective implementation of the QMS. SOPs are defined as ‘detailed written instructions to achieve uniformity of the performance of a specific function’  and constitute the second level in the hierarchy of documentation. In simple terms SOPs specify in writing the responsibilities of the personnel along with the way to carry out the activity. SOPs establish a systematic way of doing laboratory activities and ensure that activities are performed consistently by all laboratory staff. The practical day-to-day work instructions are prepared for ready reference at the site of actual work. This becomes the third level of documentation hierarchy. Instructions are required to perform a section of a procedure and can be part of a procedure or can be referred to in a procedure and published separately. The advantage of having them separate is that any changes to instructions do not require a change to the procedure. The final level in the hierarchy of documentation is the forms. These forms and the records created using them are a crucial part of the QMS as they are the evidence that a procedure and related instructions have been carried out. Pharmaceutical laboratory must establish and maintain procedures to control and review all documents (internally generated and from external sources) that form part of the quality documentation. Document control is a mechanism by which the QMS documents are created, amended, reviewed, approved, distributed and archived. It is required to ensure that only the current version is available to the laboratory staff while performing their duties. Documents must have following key elements to be compliant: a unique identifier, version control where each update to the document must result in an incremental increase in the version number, a change history that summarises the changes made to a document each time it is updated, and signatures from the preparer and approver of the document. Invalid or obsolete documents should be promptly removed from all locations to prevent their accidental use. Documents should be regularly reviewed and updated if necessary. Typical review cycles are between one and three years. If documents are held and distributed electronically, they should be read-only versions which may only be edited by authorized staff. Records are special kinds of documents that provide evidence of activities performed. For this reason, they should be legible, clear, indelible, identifiable, traceable, and established immediately after performing an activity. Records may be categorized as quality and technical records. Quality records include audit reports, customer feedback, and management reviews including records from possible corrective and preventive actions. Technical records include the laboratory registers, equipment log books, data recording sheets and reports. The laboratory must establish and maintain procedures for identification, collection, indexing, access, storage, retrieval, maintenance, and disposal of quality and technical records. The organization should also have written procedure for identifying, storing, and protecting records, in order to avoid deterioration and damage. Records should be controlled and managed by assigning unique identifiers to individual record types ensuring that they are traceable and retrievable. In pharmaceutical laboratory the records for each test must contain sufficient information to permit repetition of tests. Records should be signed and dated by the person who performed the activity. All original observations, calculations and derived data, validation and verification records, and final results must be retained on record for an appropriate period of time in accordance to applicable national regulations. Corrections to entries should be signed and dated, leaving the original entry legible. Electronic records and automated data-capture systems should meet the requirements for the control of records and should be validated. Audit is defined as “systematic independent and documented process for obtaining evidence and evaluating it objectively to determine the extent to which audit criteria are fulfilled” [1,2]. Audits are a valuable tool for evaluating QMS effectiveness, along with regulatory inspections. Audits may be distinguished as internal and external audits. Internal audits are conducted by or on behalf of the organization itself and verify that the laboratory complies with ISO 17025 standard. Internal audits are an excellent preparation for external assessments and help to continually improve the quality system. External audits (also known as external assessments) are performed by independent external organizations. The laboratory should have a procedure and a schedule for internal audits where audit criteria, scope and objective should be clearly defined. The schedule should be such that each element of the quality system and each section of the laboratory are audited yearly. Importantly, auditors should not be subjected to conflicts of interest that may adversely affect the audit, and for this reason auditors should not audit their own work. The audit program should be managed by the quality manager. Audit findings related to the quality of test results should be reported to customers and customers should also be allowed to audit the laboratory. Audit follow-up activities should include corrective and preventive action plans and the effectiveness of the plans should be monitored. Corrective and preventive action is initiated when nonconformity is observed. Nonconformity is defined as ‘a non-fulfilment of a requirement’ [1,2] and indicates that the work carried out by a laboratory is inconsistent with its QMS. Nonconformity can arise in two distinct ways: one, from an audit resulting from a problem in the conduct of a process and two, a proactive audit that produces a non conformity. The root cause of nonconforming work should be identified and adequate corrective actions are implemented, documented, and monitored to eliminate the specific problem and prevent recurrence of the same problem. Preventive actions should be initiated when potential sources of nonconformities have been identified. Nonconformities may be technical or related to the management system. The objective is to reduce the likelihood of the occurrence of such potential nonconformities. To overcome the identified problems, it is important to monitor the results of any corrective and preventive action taken and the results of such action are submitted for laboratory management reviews. The recognition of nonconformity and the implementation of corrective and preventive actions are essential elements in continually improving the laboratory’s performance. Customer complaints and feedback are key indicators of the laboratory performance to meet customer requirements. Customer complaints shall be properly documented, evaluated and adequately followed up. There should be a policy and procedure for the resolution of complaints received from customers. Records of complaints and all steps taken when resolving the complaint should be maintained. This includes documentation of investigations and corrective actions. In this section the most important technical requirements for compliance with the ISO 17025 standard are briefly discussed. Personnel are considered important as they probably have the highest impact on the quality of test results. Each pharmaceutical laboratory should ensure that all laboratory personnel are adequately qualified and competent for performing the testing and other laboratory activities. Authorize personnel should carry out specific tasks such as operation of equipments, testing of sample, issuing test reports, to interpret specific test results and to train other personnel. Based on required skills and available qualifications, a training program should be developed and implemented for each personnel and the effectiveness of the training should be evaluated. Selection and validation of appropriate test methods is also important for obtaining accurate results. The laboratory should have written procedures on the use of test methods. If standard methods are available for a specific sample test, the most recent edition should be used. When using standard methods, the laboratory should verify its competence to successfully run the standard method. For validation of test methods standard guidelines may be followed . Pharmaceutical laboratories should also ensure the quality of their results on an ongoing basis through regular analysis of quality control samples or participation in proficiency testing programs. Other critical quality control checks can include the regular use of certified reference materials, replicate tests using the same or different methods, and retesting of retained samples. Other key requirements for implementing the QMS in compliance with ISO 17025 are: uncertainty of measurement, equipment, sampling, sample integrity and reporting. Detailed description of these requirements is beyond the scope of present article. Management review is usually conducted once a year to identify any potential sources of non-conformity or other opportunities for improvement in the QMS or technical operations. Management review ensures the continued suitability and effectiveness of the quality system, policies and testing procedures. It takes account of previous management review reports, outcome of recent internal audits and external assessments, corrective and preventive actions, results of proficiency testing, customer complaints and feedback, and any recommendations for improvements. After action has been taken resulting from the review, laboratory management shall evaluate the effectiveness of the action through a focused review or audit of the area concerned. Pharmaceutical laboratory shall prepare, document and implement action plans for the improvement. Findings and the actions that arise from management reviews shall be recorded, and laboratory staff shall be informed of these findings and the decisions made as a result of the review. Laboratory management shall ensure that arising actions are discharged within an appropriate and agreed-upon time. The results of action following the review shall be submitted to laboratory management for review and implementation of any needed changes to the QMS. Organizations should implement a systematic approach for performing QMS improvements. Management reviews, audits, regulatory inspections, and QMS planning initiatives are potential triggers for continual improvement activities and should be followed up by senior management. The outputs of the management reviews are recommendations for improvement of the system, processes, products, or services and demand for resources. In a regulatory set up quality of medicine is ensured by analysis of pharmaceutical products in pharmaceutical testing laboratories which are expected to provide accurate and reliable data. Implementation of the QMS for technical support and laboratory management in a pharmaceutical laboratory leads to a well-organized laboratory with clear staff responsibilities, good communication framework, an efficient and controlled documentation system, a greater degree of internal control, a good tracking system for all laboratory processes, and a reliable infrastructure for tracing errors and complaints. Accurate and reliable data produced from accredited laboratories eliminates the need for retesting which reduces the cost of operation because of increased staff competency and minimises technical barriers to trade. Implementation of the QMS also leads to improved performance on external quality proficiency testing, reduction in client complaint, and sample rejection. Laboratory accreditation also gives a formal international recognition of quality laboratory services. To conclude, implementation of the QMS and laboratory accreditation is the best way to demonstrate and attest competence of pharmaceutical testing laboratories. ISO (2005) General requirements for the competence of testing and calibration laboratories. ISO (2000) Quality management systems- Fundamental and vocabulary. UNODC (2009) Guidance for the implementation of a quality management system in drug testing laboratories. p: 1-33. ICH Harmonised Tripartite Guideline Q2 (R1) (2005) Validation of analytical procedures: Text and methodology. p: 1-13.